If you are getting “Can’t Play Video” error in your Android device or if you are facing the similar problem and your videos not working, you will find some solutions on this page. You can ask questions through our community or you can comment this page and let us know if you know any good solution for the problem. WhatsApp Videos Not Working! How to Fix It? People have faced with this error for some reasons recently and solutions were almost same. However we are going to provide every possible solutions for you on here. 1-) Tap settings on your device. 3-) Tap on Google Plus application. 4-) Tap on “Uninstall Updates” button. 5-) Restart your phone and run WhatsApp again. This solution worked for almost everyone but if you are still getting this problem, please continue to read our solutions below. 2-) Tap on Apps or Application Manager. 5-) Restart your Android device and run WhatsApp. As we have told you all application problems and errors, reinstalling always saves life and time. You can try reinstall to application if all steps didn’t work for you above. If there is any corrupted files, that will fix it for you. 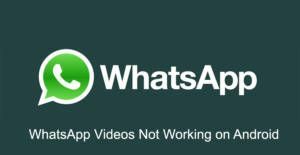 Please click here to learn how to reinstall WhatsApp.